Dahlia is a sweet little girl from China that is 5 years old. Dahlia is described as having normal physical and mental development. Dahlia can speak in full sentences and understands how to follow her caregivers instructions. Dahlia can walk, jump and go up and down stairs on her own. When Dahlia gets upset she will be comforted by getting hugs from her caregivers. Dahlia has Thalassemia B type and has a slightly enlarged liver. Other than that she seems to be doing pretty well overall. 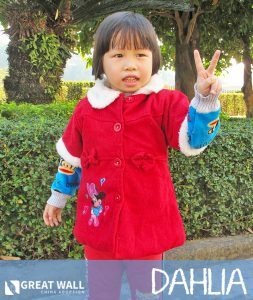 If you would like to learn more about Dahlia, you can contact the Great Wall China Adoption Home Finding Team by requesting this child’s full file on the Waiting Child photo listing or by calling #512.323.9595. Click Here to Watch one of Dahlia’s Videos! Marina is an amazing 11-year old girl who is blind in both eyes. 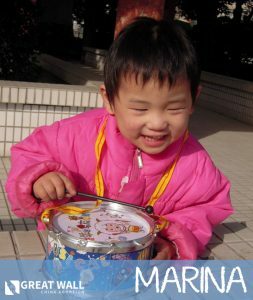 Marina is a smart, bright girl who would thrive in a forever family. She is an outgoing kiddo who loves to play with other children and sing songs with her caregivers. She follows her caregivers instructions well and appears to be doing well in school overall. She is always quick to compromise with other children and is great with sharing so that everyone gets a chance with a toy. Marina loves music and has a beautiful singing voice. Please reach out to Great Wall if you would like to learn more! 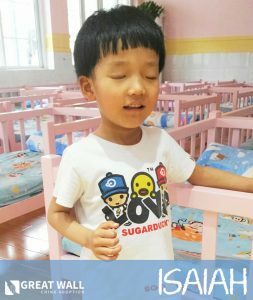 Isaiah is a sweet little boy from China that is 5 years old. Isaiah likes to interact with other children and play games with him. He is very happy when he is playing with and interacting with other children and his caregivers. His personality is described as lively and joyful, but he tends to be shy around strangers. He can speak with others in simple sentences. He likes to listen to music and hear his caregivers read him stories. Isaiah is blind and has no vision. He has already had a bilateral enucleation surgery. He does not have any other medical issues. He is very sensitive to sounds and he follow sounds when he hears them, such as when his caregiver’s phone rings, he will follow the sound and go pick it up for her. When his caregiver takes him to school every morning he will hold her hand and trot along side her. Because he is blind he cannot fully self-sufficient as of yet. He needs help getting dressed, although he can put on his own shoes by himself. 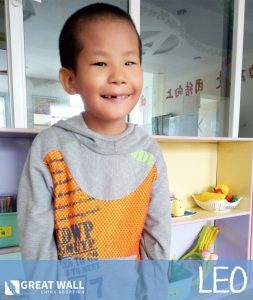 The orphanage staff feels like he is developmentally behind some of his peers, however they feel that this is due to his vision impairment and not a lack of mental capacity to learn. Isaiah appears to be a smart little boy overall, but he just needs the love and attention of a Forever Family to help him get to where he needs to be to live a full and productive life. If you are interested in learning more about Isaiah, please contact the GWCA Home Finding Team by requesting this child’s file on the Waiting Child photo listing or by calling #512.323.9595 today! Click Here to Watch one of Isaiah’s Videos! Xander is a precious little boy from China who is 10 years old. Xander is described as very intelligent and he is very curious. Xander makes good grades in school. Xander loves writing and drawing and his artwork is hung all over his school. He is very well behaved and loves helping others and has a strong sense of empathy. He is happy to help his caregivers with the chores. Xander is living at the school during the week and a foster home on the weekend. 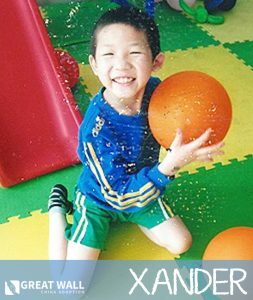 Xander is very energetic and enjoys playing with others. Xander is very fond of music and loves to dance. Xander has partial hearing loss but he can hear. His right ear has better hearing than his left ear. He can understand what others are saying by listening when they talk very loudly and also by noticing people’s mouths moving and their body language. Xander received a hearing aide in October 2010 and his hearing greatly improved. He has since been able to communicate much more and his language ability has increased dramatically. Xander asks how and why questions and is very observant in school. Xander can also read very and write. His hearing and speaking continues to improve all the time. Xander’s file is very thorough and gives a lot of great details about his personality, schooling, his hearing and speaking skills and his personal life. If you would like to view Xander’s full file, please contact the Chine Home Finding Team at GWCA today! Katrina is a lovely little girl from China that is 12 years old. Katrina is described as being extroverted and energetic. Katrina has been living with a foster family since 2008, so she is most likely receiving better one-on-one care than she would if she were living in an orphanage. She has bonded well with her foster family and gets along well with others. Katrina has been diagnosed as being developmentally and cognitively delayed. However she was later diagnosed with having a significant hearing impairment, which might be why she was originally considered to be so delayed, because they did not take into consideration that she was unable to hear what was being said around her. Katrina will need a Forever Family who is willing to take a lot of time helping her with language skills and social skills. Katrina has a lot of potential to grow and thrive if she can be adopted by a family who can give her the time and attention that she needs. 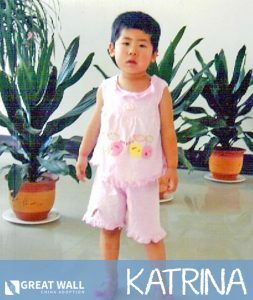 If you are interested in learning more about Katrina, please contact the Great Wall China Adoption Home Finding Team by calling #512.323.9595 or requesting this child’s file to review.